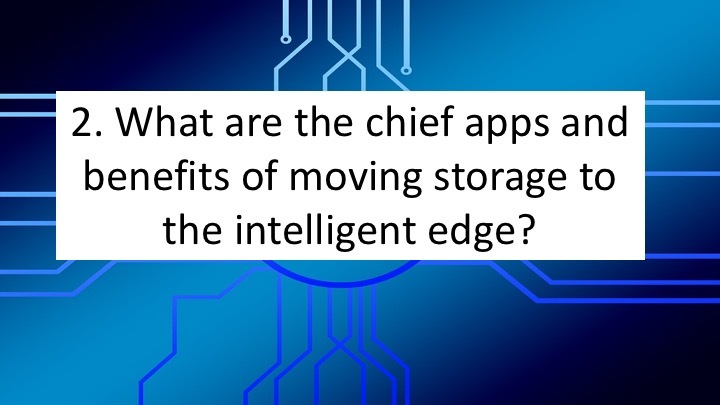 Discuss the trend under which data storage is moving to the cloud's intelligent edge. Moving storage to the intelligent edge speeds data access, boosts data avaialbility, and enables more reliable disaster recovery. Analytic applications in general. So AI/ML/IoT are but buzzwords today. Collaboration is a 2nd beneficiary. Apps that monitor and triage SCADA/OT performance. While we don't always consider it so, Public Cloud is also an edge location in an Hybrid-IT environment. Also edge locations may not have strong network connections that can handle transmission of large data volumes. @CTOAdvisor Data applications in general: intelligent edge storage can also facilitate fast in-memory OLTP at the edge. @CTOAdvisor Really? Can you explain how you define public cloud as an edge location? @BertLatamore True. It's important to be in the right edge location. Highly connected colos with lots of network options. @BertLatamore Intelligent edge technology works best when you have excellent network connectivity and a diversity of carriers. Bandwidth providers are still charging enormous rates for edge support. Sometimes, even if data can be moved, it is too expensive to move. @jameskobielus If you still have a enterprise DC strategy but use Public Cloud for purpose built applications such as R&D, it's an edge location. It's massive in compute/storage capacity but it's not your central data repository. Good one. Yes, each colocated storage facility is its own "edge" for the purpose of persisting data there for speeding access to that data by downstream users/apps. easier to move, expensive to retrieve! @MarcJKeating Sometimes the edge locations do not have that connectivity. A drilling platform in the middle of the Caribbean, for instance. @CTOAdvisor Oh, yes. The edge storage can refer to any purpose-built node, cluster, or zone for data persisting/access to a replicated segment of the larger central data repository. It also depends on the purpose of moving or accessing data is. If you're simply trying to back up the data on the oil rig, for example, and you have a 24 hour RPO, you could send tapes on the daily supply ship. @MarcJKeating Microwave would be another choice, again fairly expensive. Better to analyze the data on site & send the results of the analysis rather than the raw data in many cases. 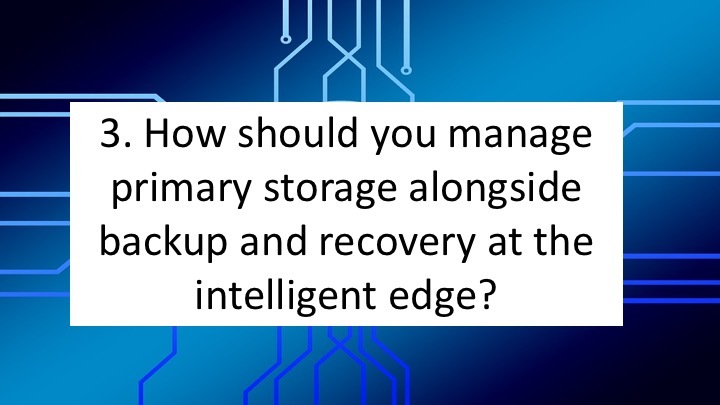 How should you manage primary storage alongside backup and recovery at the intelligent edge? I'd like not to worry about this at all. It either integrates into my existing backup platform or is part of the package for a intelligent edge solution. I don't want a new solution for backup because the data is physically located at the edge. The edge should be used for it's purpose.. high speed data access while backups can be pushed out to the cloud for long term. A well-architected storage architecture should seamlessly replicate data from primary storage to backup/recovery edge nodes/clusters. 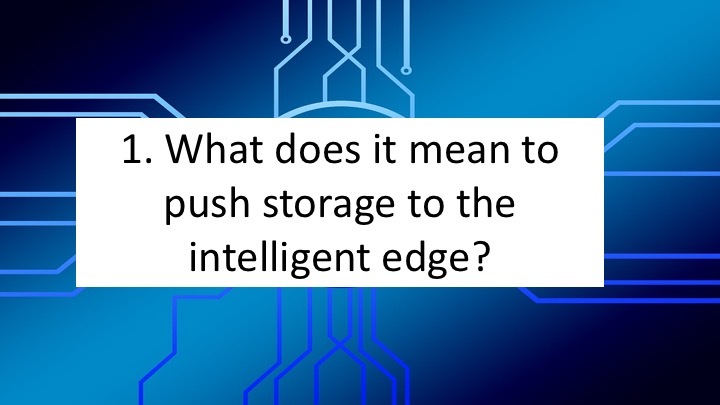 That's are core definition of intelligent edge storage. @CTOAdvisor Edge RPO/RTO: That's policy-driven, right? Many B/R solutions don't support edge-oriented policies well. Unless I'm using my BUs during the day for purposes other than traditional backup, I don't want them on my edge. I want them available when I need them and my edge to service my app compute. Like all things it depends. What are you trying to protect against in backups vs. snapshots? If you have to restore from backup then do you enact your BC plan vs. recovering a corrupted file locally? @DarrenMilr So, essentially, you're defining edge storage's primary use case as fast data access. Right? Synthetic (do they even use that term anymore) backups from the edge to the core combined with local snapshots may meet most recovery scenarios. How often do you need to recovery TB's from backup? That's never a good situation. the ability to push/pull data as close to the consumption point as possible. Follow the data. Increasing, we're moving services to the "moment of execution." Pushing storage to the intelligent edge involves persisting data close to users/apps to speed query, analysis, transactions. etc. We are no longer able to say just move compute to the data. How do you move cloud-based AI/ML to the edge? Pushing storage to the intelligent edge is all about delivering flash-grade performance consistently through smart data movement/placement near access. @jameskobielus Why does it have to be flash-grade? Does every edge use case require flash-level performance? @CTOAdvisor Yes. Perhaps also it's the abiity to selectively cache the most-accessed latency-sensitive data to edge devices and gateways on the fly. One more thing about intelligent edge: Encourage use of AI, ML and other technologies that can triage actions or provide automation. Move data to models at the edge. Yes, and perhaps also dynamically move selected data to mobile devices to ensure fast access with discontinous connectivity. So all this sounds great...how do we actually make it happen? Are organizations already doing this successfully? @CTOAdvisor Yes, of course not every use case requires flash-grade data access latencies. Intelligent storage infrastructure matches user latency requirements with data movement/persistence. Right. Moving data to the edge should also involve moving "intelligence"--in other words, machine learning algorithms etc all--to execute on edge nodes. This supports the new generation of data-driven AI apps at the edge. Physical storage is just one part of the intelligent edge. Data services at the edge is even more critical. It's the great normalizer of hybrid-IT.